The 4Berries high-quality antioxidant extracts, combined to the high concentration of hyaluronic acid and stem cells, ensure a filling action on facial wrinkles for a more youthful, firm and smooth skin. 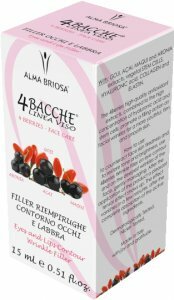 How to use: counteract face skin fatigue and restore tone and brightness using 4Berries Wrinkle Filler on eye and lip contour as well as on deep wrinkles. Tap the serum gently. After application the product provides a pleasant tensor effect. The effect vanishes after the complete absorption of the active ingredients. INGREDIENTI/INGREDIENTS: Aqua**, Hydrolyzed collagen**, Caprylic/capric triglyceride**, Aristotelia chilensis fruit extract */**, Aronia melanocarpa fruit extract**, Euterpe oleracea fruit extract**, Lycium barbarum fruit extract**, Hydrolyzed elastin**, Sodium hyaluronate**, Vitis vinifera fruit meristem cell culture**, Xanthan gum**, Potassium sorbate.